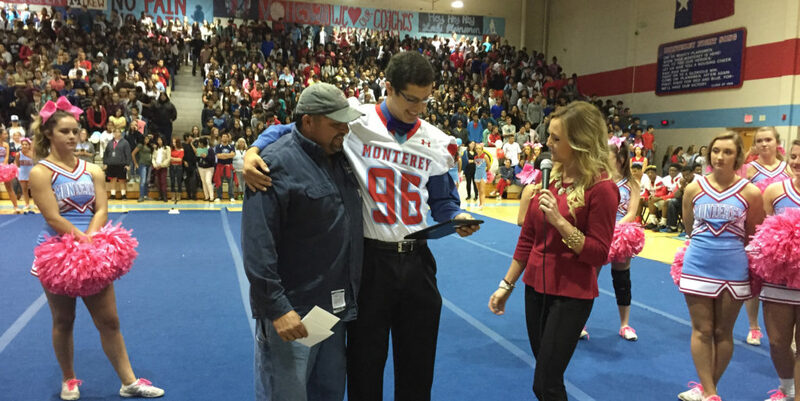 Lubbock Monterey's Tommy Calvillo — standing his father, Daniel — is awarded the Unsung Hero Award from Amy Riggan of Texas Farm Bureau Insurance at a Monterey pep rally. Tommy Calvillo is a very solid football player. He works hard at his craft and has become an important player for Lubbock Monterey head coach Wayne Hutchinson. But if you measure Tommy by how he’s doing between the white lines, you’d be missing a ton. Each fall, Dave Campbell’s Texas Football honors five young men who exemplify the qualities of leadership, community service and teamwork. We call it the Unsung Hero Award and our partner Texas Farm Bureau Insurance helps make it happen thanks to their support of $500 for each recipient toward their college fund. Selecting Tommy Calvillo as one of our five this year was as obvious as saying Lubbock is sort of flat. Away from the football field and weight room, Tommy is as busy and productive as any young man we’ve honored with this award. He’s the student council president, a big player in the school’s choir and a key cog on his mock trail team.